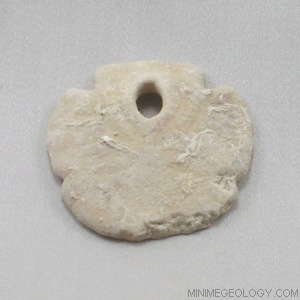 You will love this ancient Sand Dollar fossil also known as Encope Tamiamiensis. This Pliocene age (approximately 1.8 to 5 million years old) Sand Dollar is from Charlotte County in Florida. Sand dollars are a member of the echinoid group of sea animals and have flattened shells made of small, limy plates and have five-fold radial symmetry. Members of the sand dollar family are still in existence today, but you can get your fossil sample today. An information card with details on the rock formation, mineral content, characteristics, and uses is included. Typical samples sizes are generally 1.0 to 1.5 inches in length or width but can vary based on availability and natural fossil shape. © Copyright Mini Me Geology / Giverny, Inc. All rights reserved. Mini Me Geology is a division of Giverny, Inc.